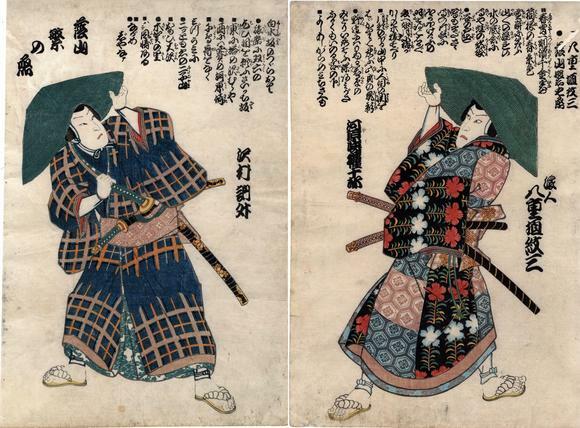 This ōban diptych is unusual in that it is unsigned and has no censor or date seals. Waseda University says that it is by Toyokuni III, but the Museum of Fine Arts in Boston says it is anonymous. This diptych is believed to commemorate a performance of Kosode Soga azami no Ironui (小袖曾我薊色縫) at the Ichimura-za in 2/1859. In the curatorial files for a different diptych in the British Museum it says:" ‘Kosode Soga azami no ironui’ (小袖曽我薊色縫, also called ‘Sato moyo azami no ironui’ 花街模様薊色縫, commonly known as ‘Izayoi Seishin’ 十六夜清心) by Kawatake Mokuami, performed at the Ichimura-za from the 5th of the 2nd month, 1859 (Ansei 6)."